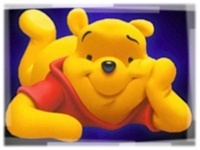 A.A. Milne who created ‘Winnie the Pooh’ has his birthday on 18th January, 1882. A.A. Milne’s son Christopher Robin at the age of nearly 1 year old got a stuffed bear as present. A.A. Milne drew inspiration from that bear to start writing a series of children’s stories and poems.